Co-D Therapeutics’ lead product Triolimus, for the treatment of angiosarcoma, breast cancer and non-small cell lung cancer, is in preclinical development. Triolimus is a 3-in-1 nanomedicine that carries paclitaxel, rapamycin, and 17-AAG for combination cancer therapy (Fig. 3). Paclitaxel is the best selling anti-neoplastic agent of all time with broad application, but drug resistance is common. 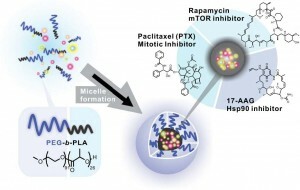 2-drug combinations of paclitaxel and rapamycin(mTOR inhibitor) or of paclitaxel and 17-AAG(Hsp90 inhibitor) have entered clinical trials, seeking to overcome drug resistance, and results are promising. However, all three agents are poorly water-soluble, and they require an injectable formulation, e.g. Cremophor/ethanol and DMSO/lipid for paclitaxel and 17-AAG, respectively, which adds to the toxicity of drug combinations and lowers drug efficacy.